A 40-year decorative painting veteran and also the owner of Cupboard Distributing and Pixelated Palette digital magazine, I enjoy designing, painting, teaching others to paint and express their creativity! In my book DecoArt Americana Acrylics are the best on the market. The paints are everything I want when putting the brush to the pallet. So I was a little sad when I received notice that 19 Americana colors had been “retired”. Sigh, we are creatures of habit and when news of discontinued colors arrives, panic and frustration can result. However, I encourage you to look on the positive side. 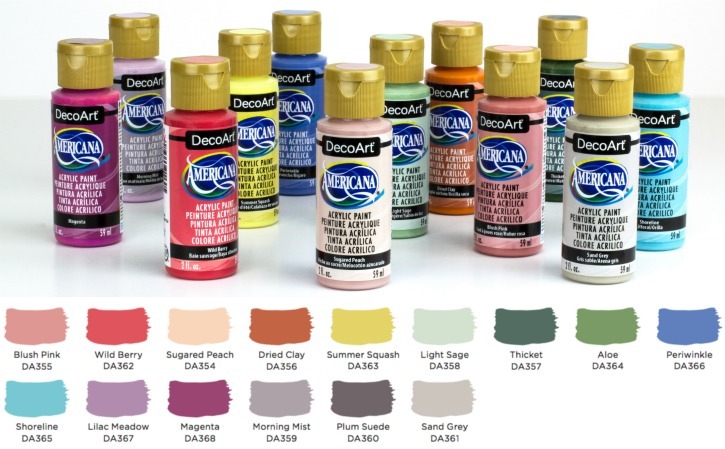 DecoArt added 15 luscious new colors this year bringing their line to 253 beautiful bottles. We certainly should be happy with that many color choices. I think the biggest problem is the inconvenience of trying to figure out how to substitute alternate colors for those favorite and cherished patterns in our stash. After looking at the retired list, I have decided to make a new list that may be of help. My list is a “closest color” substitution suggestion. Please note that these colors are close, not exact. If you decide to lighten or darken, don’t use black or white. Instead, to darken, try a touch of an earthy color such as Charcoal Grey, Soft Black, Black Green, Payne’s Grey etc… (and remember, just a touch!). To lighten, use a light color such as Sugared Peach, Natural Buff, Bleached Sand, Warm White, Sand Grey, etc. .. Also, if you want to replicate the color, DecoArt offers a Retired Colors Mixing Recipe chart (just click to view). My advice is to be a little daring in selecting colors. Just because we have “always” used a certain color, doesn’t mean another color won’t look just as nice. As with any trend, not only things change, but colors change as well. If not, we would all still be using Harvest Gold and Avocado Green or French Mauve and Country Blue! It has been 3 years since DecoArt retired colors. I had a “how dare they” attitude 3 years ago, however, after I calmed down, I looked at the colors I thought I could not live without and picked new substitutions. To my surprise, the new colors were so much prettier and my designs results much more appealing. So in spite of a little inconvenience, I think we should thank DecoArt for keeping their finger on the pulse of fresh, modern trends. Be bold, confident, pick new colors, and watch the colorful magic unfold! This entry was posted in Uncategorized on November 11, 2018 by Chris.